Ah… the Hotel was a rustic, traditional Japanese TATAMI hotel. It was a little scary as it smelt of Onsen bath and old people (hahahaha). Kidding, but really, the dining, living and sleeping in this hotel was amazing. The hotel overlooked a fabulous lake and (Drum roll please…. ) Mount Fuji! It was breathtaking to say the least. I was tempted to take out my asics and run round the lake … but the temperature of 8 degrees Celsius kinda put me off..
We were served up traditional breakfast …. .. and had to sit cross legged for all the meals..
Also, seeing as the flooring was all tatami style, we had to pack a small day bag, and carry up the luggage (no rolling on the precious tatami flooring) to our own rooms. I don’t have any photos of the Onsen spa (for obvious reasons).. but let me just say, “Hanging loose and fancy free” is totally the motto of this place…. 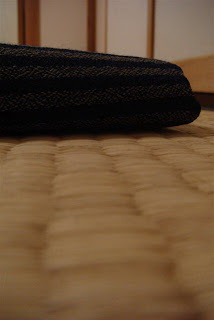 When you check in to the onsen, you are given a little towel and a big towel. If you have never been to the Onsen, your first instinct would be to wrap the large towel around your body. If you do that, you will be the laughing stock of the bath. Buck naked and with total blase is the only way to approach the bath… The more your cower and hide, the more obvious you will be. Make like its the Garden of Eden and you will blend just fine ! Next articleTokeiya @ Kobe, Japan – eating kobe in kobe!